There will be a new home for several NBA Blue Devils this coming season including one of the all time Duke favorites JJ Redick. In case you missed it, Redick was part of a three team trade and deal which landed him with the Los Angeles Clippers. Redick joins the "hot." team in L.A. in the Clippers who look to be one of the better teams in the west this season. The Lakers which recently lost Dwight Howard to free agency will take a step back and the window is open for success for the Clippers who now have Glenn "Doc," RIvers running the team. As for Rivers, he actually mentioned Redick as a shooter in a conversation I had with him when Duke was recruiting his son Austin. In short, Redick has a good new home and with an aging Chancey Billups at the SG spot, he has a chance to start or play a major role this coming season. 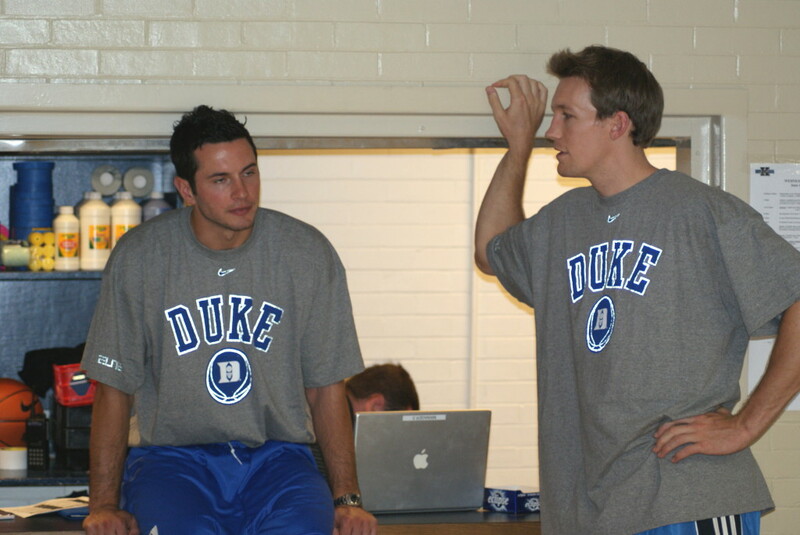 Also on the move is former Duke standout and national champion Mike Dunleavy who will now suit up for Chicago Bulls. Dunleavy joins two other former Blue Devils in Luol Deng and Carlos boozer provide there are no further moves in Chi-town. 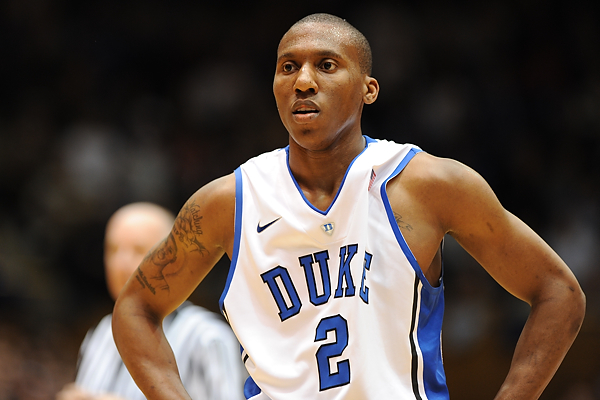 Another Blue Devil who will have a new home is Nolan Smith who was to play with the Boston Celtics in the NBA Summer league but he just suffered a lower leg injury and is now in a boot. Mason Plumlee dropped a dunk during day one of the NBA Summer League that is drawing raves and supposedly yelled "Get some," as he ran back down court. Mason has a bit of a chip on his shoulder for those who thinks he is an older rookie with less upside. I think folks will change their tune over time about kids remaining until their senior year hurting their chances. Meanwhile, the Blue Devil who never was, Shaun Livingston will be a teammate of Plumlee in Jersey where the Nets have signed the former high school standout. For those who have not followed Duke recruiting over the years, Livingston was a high school prodigy who gave Duke a verbal only to bolt for the NBA late the game before he ever played a game at Duke. His departure coincided with Luol Deng leaving after his freshman season after he had told the Devils he would return leaving Coach K's Dukies in a bit of a lurch. Sadly, Livingston suffered a major injury which has effected his career and many felt he needed a year in college for his body to catch up. Anyhow, Livingston was the original point of frustration for Duke fans in that they never got to see the top rated PG in the class and until that guy named Kyrie Irving came along. Irving, of course, got injured where he played in just over ten games for Duke leaving fans and the staff to wonder what it would be like had he had a full year in Durham. Those who remember Livingston realize he could have been one of the greats and it took a player of Irvings' stature to wrestle away the top "what if," spot in the K era. Another player who will join Redick in Los Angeles will be incoming rookie Ryan Kelly. The two will be rivals though, in that Kelly will be a Laker. That means when Kelly gets burn he'll be closer to the Hollywood stars than he probably ever dreamed with the A-list straddling courtside seats. Kelly and his soon to be wife, Lindsey Cowher, daughter of former Steelers coach Bill Cowher will now have state of the art theaters at their disposal. The two are notorious movie goers where Kelly came clean that his favorites were romantic comedies. Anyhow, Hollywood is getting two character young men in the aforementioned Redick and Kelly who both make faith in Christ a big part of their lives. Lastly, it was good to see Kyrie Irving get some help in Cleveland during the most recent NBA Draft and yes, Duke fans are still wondering aloud what a full season of Kyrie would have been like in Durham. I followed Irving closely on the recruiting trail when the Blue Devils were chasing him and to this day, no player was more exciting to the senses in that he simply did things on the court I have never seen since. Irving was special. He was worth the price of admission on the AAU trail, much less the league and he will now be able to play for Coach Mike Krzyzewski again for Team USA. I, for one, am excited to see that. This week is all about Atlanta. Duke in Atlanta, that is. 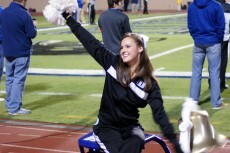 The Blue Devils basketball and football teams will visit the land of the Peach Tree in two high profile games. Coach Mike Krzyzewski and his charges will jump first on Tuesday evening, when Duke takes on Kentucky in a Battle of the Blues. This game is part of the State Farm Champions Classic, and pits two of the nation's most storied programs facing off in an early season slugfest. On Saturday, the football team takes on Georgia Tech and with a win, followed by a victory in their final home game against Miami, the Blue Devils can play for the ACC Coastal Division title. So there is no doubting that Hot 'Lanta will be the center of the Duke universe this week. 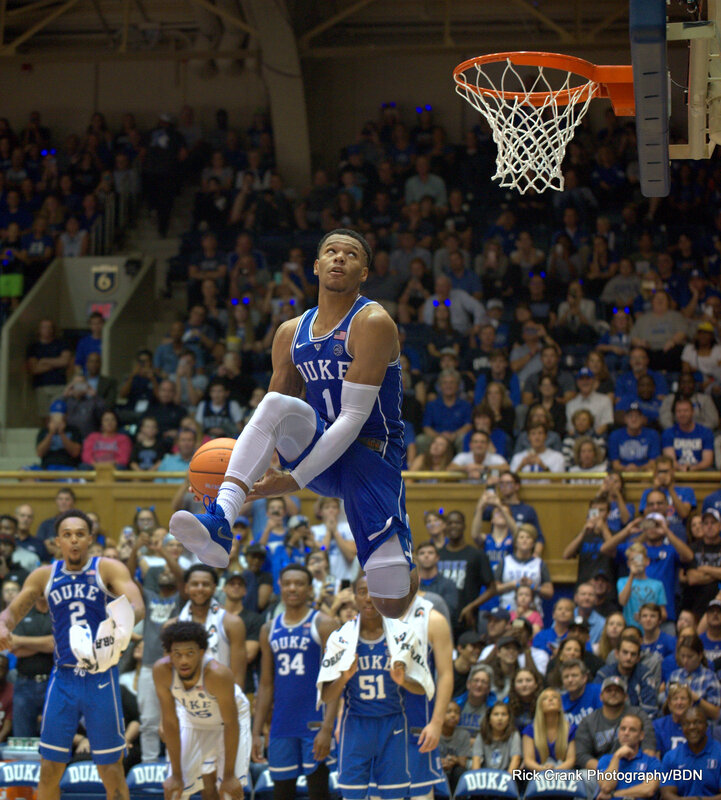 Two thoroughbred programs will take to the court tomorrow evening in Atlanta, and by evening's end either the defending national champions will once again be standing tall or Duke will have served notice that they are a true contender for this season's crown. A lot of folks want to make something out of early season basketball games, more so than they should at times. 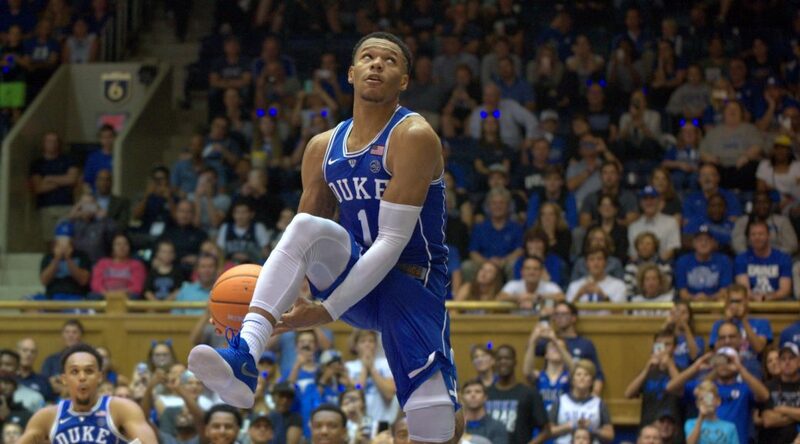 Even if it's true, the fact that neither Duke nor Kentucky played all that well in their season openers really means little, as those performances indicate almost nothing about how the season will ultimately go. The winner of this game could have a leg up with the polls and the talking heads, if nothing else. That is, until Duke next travels to the absolutely loaded Battle in Atlantis. During today's press conference, we got nothing more than the standard coach-speak from John Calipari. He was quick to point out that Kentucky is a freshman-dominated team, when in fact their veteran depth is very much alive and well, and in reality is likely the key to a Wildcat win. Calipari also mentioned that PG Ryan Harrow, a transfer from N.C. State, has been sick, is still sick, and may not make the journey. This means he'll likely play. Calipari also mentioned that Duke would probably have the most fans in the arena, when the reality is that Atlanta is known for garnering a huge Kentucky turnout. I'd take the bet that attendance is 2 to 1 or better for the Big Blue Nation. Calipari also mentioned the Wildcats would have to rebound better, but that goes for Duke as well, as the Blue Devils have not been as proficient on the boards as many anticipated in their two exhibition and one regular season game. Coach-speak comes in many forms; Krzyzewski has his own, so sometimes you're forced to read between the lines. The bottom line is this: it's a huge matchup, especially for the fans and the network. We'll go into more detail in our game preview a bit later, and we'll be in Atlanta to bring you all the latest from court side. The Duke football team will take its turn in Atlanta this Saturday at 3:30 when they face Georgia Tech. The Blue Devils are a double figure underdog. A few weeks ago, a lot of folks were pointing to this game as the best chance for Duke to get to six wins, but this is ACC Football -- and much can change in a single weekend. Now the Yellow Jackets are peaking after they blasted North Carolina on the road, putting up ridiculous offensive numbers. In order to become bowl-eligible, Tech needs wins in its last two games, versus the Blue Devils and a highly ranked Georgia team. Which team do you think their coaching staff feels they have the best shot to defeat? Duke was off last week, so had extra time to prepare for the vaunted option attack that many teams struggle to stop. It'll be up to the Duke offense to put up enough points to win in what could be a wild and woolly affair. A lot of great story lines in this one, and a Duke win sets up a game with Miami next week where a win would vault them to the ACC Championship game versus (probably) Florida State. But first things first. The Yellow Jackets are more than just a bump in the road. The beauty of the whole thing is that nobody would have thought that Duke's final two games in 2012 would have such meaning, and that they'd have the opportunity to actually compete for a championship. When Duke was searching for a football coach, they landed David Cutcliffe, but before that happened they interviewed Paul Johnson, the current Georgia Tech coach. He took the Tech job for less money than Duke offered, and it has been rumored that he's not said a lot of nice things about Duke's program ever since. His teams handled Coach Cut's early teams easily, but the gap has closed. Or has it? We'll find out this Saturday. It is also worth noting that Duke senior quarterback Sean Renfree ended up deciding between Duke and Georgia Tech, so this game has to have some extra meaning for him as well. As I said, lots of story lines. I think you will see a physical game, with the toughest team coming away with the win. With conference championship implications on the line, this is one of the biggest Duke football games in some time. Everybody noticed that Alex Murphy didn't get any burn in the season opener against Georgia State. We decided not to address this situation past what Coach Mike Krzyzewski said, which was that it was a coach's decision. I suppose it's because we've been around the Duke program for a long time and have seen this same type of thing happen to many players, including the likes of Nolan Smith. The bottom line is while it may be a shock to some that Murphy did not play, many Duke players in the past have had to pay their dues, or been in some sort of similar place that Alex is in now, and the vast majority of them worked things out over time. I have no first-hand knowledge of the situation, but I would advise against overreacting to this one game decision. A single game-day decision is by no means a long-term projection as to how things will go. My bet is another player will be on the bench at some point this season while Murphy plays, and then I will have to start this explanation all over again. That's it! Let's wait for something more clear and consistent to emerge. Semi Ojeleye visited Duke on his official visit this past weekend. There are no first-hand accounts as to what happened, only that he is a sealed deal for Duke. Ojeleye is an interesting prospect who fits the Duke mold in more ways than one. He's an athletic and versatile player who is unlike many of the current kids on the roster, and he already possesses a college-ready body. In his second season, Kyrie Irving is looking like an NBA All-Star. If you can get past some of the garbage pail offerings from the likes of SB Nation, you will find a lot of good stories on his start to the season. Here is one of the better reads on Kyrie. In the final game of his freshman campaign, 6'3" guard Isaiah "Boogie" Briscoe scored a team-leading seventeen points for St. Benedict's against eventual ESPN National High School Invitational Champion Findlay Prep. Throughout the season, Briscoe demonstrated a maturity and fearlessness that belied his youth. Playing for a program that starts very few freshman, Briscoe nevertheless started in the Gray Bees backcourt with the New Jersey Gatorade Player of the Year, 6'2" Tyler Ennis, and 6'3" future Miami Hurricane Melvin Johnson. Under the guidance of Mark Taylor, they elevated the program to a 36-3 record, with Boogie averaging over thirteen points and over five assists against a challenging national schedule. For his efforts, the Union, New Jersey native was named to the MaxPreps Freshman All-American team, along with his close friend, 6'11" Karl Towns, also of New Jersey. Briscoe received scholarship offers before he ever set foot on a high school court, and they have continued to rain in from across the country. He has already received offers from Syracuse, Connecticut, Arizona, Florida, Baylor, Cincinnati, Rutgers and Seton Hall, as well as interest from Duke, Kentucky, and Ohio State. Briscoe's bloodlines are long and deep. His dad, George Briscoe, was a standout for Stockton State College in New Jersey, and now works in Newark, NJ as part of a community action group. His older sister, 5'11" Iasia Hemingway, just finished her final season as a member of Syracuse's women's basketball team. Isaiah's cousin, Kyrie Irving of West Orange, NJ and Duke University, was recently named the NBA's Rookie of the Year for the Cleveland Cavaliers. 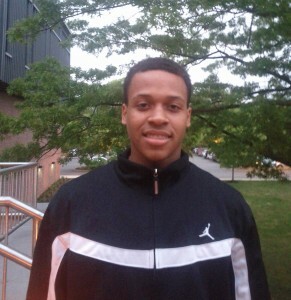 "Boogie" Briscoe has other connections to Duke University. St. Benedict's is the alma mater of 2010 National Champion and current Hornet forward Lance Thomas. Coach Mark Taylor coached former Duke All-American and current ESPN analyst Jason Williams for four years at nearby St. Joe's of Metuchen, NJ. At a press conference at the NHSI, Coach Taylor reportedly said that he sometimes teases Williams that Isaiah may wind up developing into a better player than the former national high school player of the year. There's been no rest after the high school season for the promising young guard from the Garden State. He's now played ten Nike EYBL games this AAU season for the New Jersey Playaz, the AAU program of former Duke guard and current Bobcat Gerald Henderson, and helped them qualify for next month's Peach Jam in South Carolina. Briscoe participated in last month's Mary Kline Classic, a charity basketball event dedicated to raising money for brain cancer research, named after the mother of his close friend Alex Kline. This June, "Boogie" Briscoe headed to Long Beach, California to participate in the Pangos All-American Camp. Although he was one of the youngest participants, his fearless play resulted in his being named a Pangos Cream of the Crop Top 30 selection. Last weekend, Briscoe participated in Nike's Elite 100, a St. Louis-based showcase designed to find and enhance some of the best young talent in the country. Isaiah "Boogie" Briscoe spoke with Blue Devil Nation about Coach Taylor's comparison to former NBA lottery pick Jay Williams, about fighting complacency, and on the advice he received from Kyrie Irving, among other things. You know I had a great first year. I think I finished with 517 (points) playing with Melvin (Johnson, a Miami commitment) and Tyler (Ennis, the Gatorade Player of the Year for New Jersey). It was a great experience. We went 36-3, went to ESPN Rise, and I just think we played well. You had a chance to play on national television this year in the NHSI. It was a great experience to play on ESPN and going against great guards like Dominic Artis. Just playing in front of everybody and competing is just great and I had fun. We competed. Did you feel any added pressure being on TV? I don’t believe in pressure so playing on TV is like playing here or on the playground or anything like that. What did you think when your coach at St. Benedict's, Mark Taylor, said you may wind up better than Jason Williams. How do you feel about that comparison? That’s some pretty high praise. Yeah, it is and it’s a blessing. You know I’m a freshman and comparing me to the second overall pick in the draft, it’s just a blessing and as I continue to work hard maybe I can follow after him. I mean he was a lottery pick and the player of the year in college. It's a lot to live up to. He's a tremendous player. Speaking of Jason Williams, another Duke guard, your cousin Kyrie, just won the Rookie of the Year award in the NBA. You must be very proud of him. You know that’s great. I work out with him sometimes when he’s back home so him winning rookie of the year is just great for the family and everything. I just want to follow in his footsteps especially and keep it in the family. Does he give you any advice? Yeah, he always gives me advice. He tells me to keep working hard, do right in school, keep my head straight and everything else will follow. Well, you know we’re going to the Peach Jam. I want to do well in the Peach Jam and perform well. And just get in the gym and work on my speed and agility with my father and that’s probably it. You were mostly a combo or two guard on the St. Ben's team, but what do you view yourself as long-term? I'm a point guard, but, with Tyler there, he's one of the top point guards in the country. I'll do whatever I have to do for us to win. If Coach wanted me to score more, I scored more. Pass more, drive more, whatever, I'll do it. With Ty and me in the backcourt, we're gonna be tough next year too. After he graduates, I'll move over to point guard. It's his time to shine. What's it like playing with Tyler? He had a great year in his own right. Gatorade Player of the Year. You guys are relatively close in age, but is he able to mentor you a bit? He's been great to play with and we've got a good chemistry. He shows me some things. Oh, yeah, definitely. He makes great decisions. He takes good shots and he can find the open man. He makes it look simple. People are always interested in recruiting. I know you've already got a lot of programs after you. Can you list some of the programs that are interested in you? Yeah, I've been blessed. UConn, Arizona, Syracuse, Florida, Rutgers, Seton Hall, Cincinnati, Pittsburgh, and Baylor have all offered so far and schools like Duke, Kentucky, and Ohio State have shown interest. Are you in a rush to decide? No, I guess I'm not in a rush, but I'd rather decide sooner than later. My mom would like to take my time. I'm not sure, but I don't think I want to take, like, four years to decide. What do you consider some of your strengths and weaknesses right now? My strengths are that I’m an all around point guard. I can play combo, so anything that coach needs me to play I can play. I can score, penetrate, pass. I'm competitive. My weakness, I’m not going to tell you my weakness, you’re just going to have to find out (laughs). I'm working on getting on my handle, my outside shot, getting quicker, and some footwork. Are there any players you try and model your game after? Deron Williams, Chris Paul, and Tyreke Evans. Kyrie too. 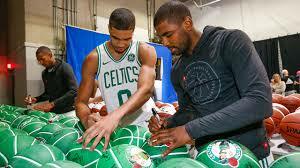 Kyrie has taken over that motto of ‘humble and hungry.’ Is that something that you try to follow? Yeah, yeah, I follow that motto. You know just try and stay level-headed, don’t get too big headed, and just continue to do what I’m doing. Stay hungry! There's always a concern that some young people who are ranked highly will become content and satisfied. How do you fight or guard against complacency and not rest on your early laurels? Just never rest (smiles and laughs). You know whenever I get a chance to go in the gym I’m working hard. Everybody in Cali is always working hard when I’m sleeping so I just got to work hard when I get a chance. I know that there are guys in my class working on their game in Chicago and Vegas and Jersey. You can't let your guard down. What are you looking for in a program when you finally make a decision? A great education, open court games, pick and roll, a great coach and system and things like that. Are you, at least, a B student? Oh, yeah, definitely. My family always pushes me. How about your coach? What do you want your coach to be like? I want him to yell at me and everything, but also understand the game. I want a hall of fame coach and things like that. I want a tough and fair coach. Coach Taylor has helped push me. I like that. Where do you like to catch the ball most? Usually on the wings… I can pass, shoot or drive. Tyler gets me the ball in good spots. Your dad credited some of your toughness from playing a lot in Newark. Do you feel that has had an effect on you and playing with toughness? It made me a tougher person. When I was younger, I would always hang out with older guys and they’d show me the ropes of the streets and everything. Let’s discuss your defense a little bit. Where do you feel you’re at with that right now? If it was graded I think I’m at a solid B. My defense is getting better and it got better dramatically during the high school season. Coach (Mark) Taylor (St. Benedict's head coach) helped me a lot on my defense so it’s getting better. Do you have any visits you’re taking this summer? Yeah, I didn’t plan it yet, but I’m going to visit Arizona and Florida this summer. Who do you think is the toughest player you’ve had to play against? I’d say Dominic Artis (2012 Oregon signee) and Kyle Anderson (2012 UCLA signee), those are probably the toughest players I’ve played against. There aren't too many high schools that have produced an NBA player, let alone multiple ones at the same time. At Saint Benedict's, you've got guys like J.R. Smith with the Knicks, Lance Thomas with the Hornets, and Samardo (Samuels) with the Cavs right now. Is there a lot of talk internally about things like legacy or looking to those guys as, sort of, role models? Yes and no, we look at those guys like we want to get where they already are and we don't want to let the program drop or anything, but we just try to work on our games and win right now. 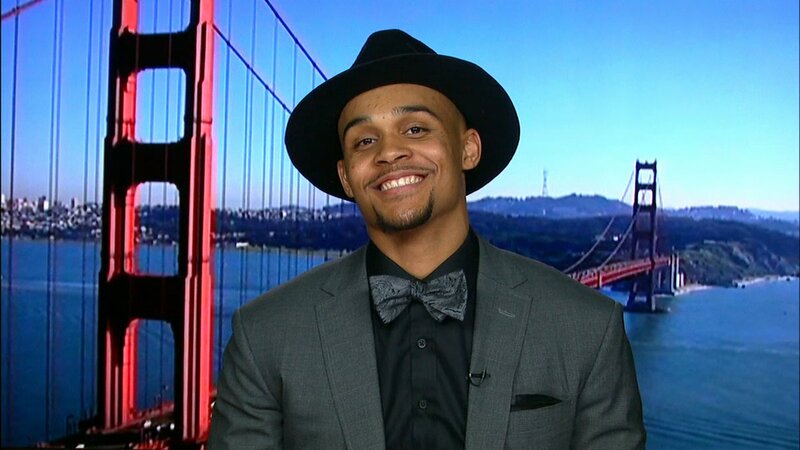 Hopefully, Melvin (Johnson) will make the NBA and then Tyler (Ennis) and then me. I definitely hope to join all of them in the NBA one day. I'm just trying to work on my game and, hopefully, one day I can get there too. That's all I can do, you know, work. We respect all of them… a lot. What are you hoping to show coaches this summer? That I play hard and smart. I want to show them that I can play with the ball and without. I want to show them that I can score, pass, and that I'm an all-around type of player. I love playing basketball…and hopefully they can see that too. Can you tell the audience a little bit about your family? Your dad works as part of a community group in Newark and I heard that your mom works in a financial business? Yeah, my dad tries to help the community in Newark and my mom works in an accounting office. So, that's why you do well in school. She's pretty smart? You played well in the Mary Kline Classic and helped with the games and some of the behind the scenes things. Oh, yeah, well, it's a great cause and Alex (Kline) is a great person. I just wanted to help in any way that I could. There were a lot of good players in that game. I mean Alex has been great to me and helped me a lot with advice. It was a lot of fun and we helped to raise a lot for an important cause. I talk to Alex almost every day. 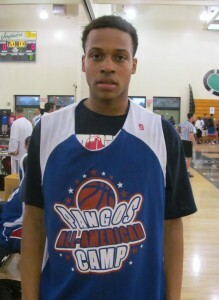 What about the Pangos All-American Camp? Well, it's great to have a chance to play against some of the best kids from around the country. I think I've played well out here and learned some things. It's been fun. That I'm a happy kid that likes to make people laugh and smile. That I'm a good kid and I work hard. People always say that I make them laugh. Speaking of working hard, you work out regularly with your dad, who used to play in college, on Saturday mornings. What do you guys work on primarily? Oh, we work on just about everything. My handle, shooting from all areas, conditioning. We practice and play for hours. He gets after me. Speaking of conditioning, what are you trying to do with your body? Get leaner? Get stronger? What are you hoping to improve about your body? I'm actually pretty lean. It just looks bigger than some guys my age. We're trying to get quicker and stronger. Those are pretty much the main things. Where are you working on your strength? At school, a local gym, or home? What are your expectations and goals for the next high school season? We're going to try to win the national title. We want to win the NHSI. We came very close this year, but we'll be better next year. I've got to continue to improve. We've got some good talent coming in too! Has Coach talked with you about how your role or responsibilities might change? 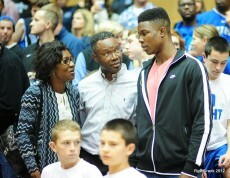 Yes, he said that I'll be handling the ball more and playing mostly with Tyler. He expects me to step up and take more of a leadership role as a sophomore. I've got to keep improving and working. Help the team and be an example with Tyler for other players. Can you give the audience a scouting report on Karl Towns, one of your close friends? Also what's he like as a person? Oh, he's an incredible player. Karl can shoot as well as any guard, but he's about 6'11." He's got great post moves and he'll show more of that this year. He's a great defender and he's getting stronger too. Off the court, he's smart. Karl's a leader and just a great person. He loves to laugh too. He cares a lot about people. We used to play on the same AAU team, but we don't now. You think that you'll play together again in the future? You were named to the MaxPreps Freshman All-American team. What did that honor mean to you? Oh, I'm always grateful for every award or trophy. I'm trying to help my team win and get better, but it's always great to have somebody say something positive about your work. It means that you're doing something right…and I've just got to keep it up. I can't rest or let it get to my head. How did you get the nickname "Boogie?" Oh, it was when I was really young. I'm not sure what age exactly, but I kept running around and people just started calling me "Boogie." In the future, would you rather I call you Isaiah or Boogie? Oh, it doesn't matter to me. It's whatever you prefer. Before one of the schools that you mentioned showing interest in you was Duke, what do you know about their program? They're recruiting me. They're always one of the best programs in the country. They've got Coach K. He's a Hall of Fame Coach. He spoke to me when I was younger. They've sent a lot of guys to the League. What did Coach K say to you? Just advice. He just told me to keep working hard and maybe they'll recruit me one day. It was real cool. Do you have any plans to visit their campus? What do you know about the school itself? No, not yet, but maybe someday. I don't really know too much about the campus or school. I'd like to know more. What is their pitch to you? You know, just that I’m on their radar and to keep working hard and to make sure that I’m doing right in school. You’re still very young so you have a long ways to go. 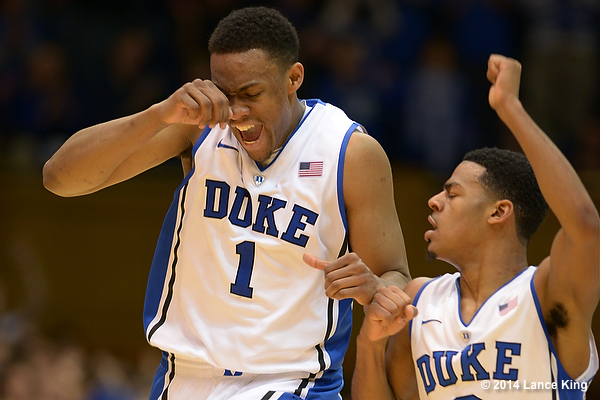 Usually, Duke doesn’t start getting very serious until players are a little older than you. Yeah, I don’t know a lot about Duke yet. I know Kyrie went there and they have a lot of NBA players, and Coach K’s a Hall of Fame coach. Who's your favorite pro team? I really don't have one. I like individual players. I like to watch big or strong guards like Deron Williams, Tyreke, Kyrie, or Chris Paul. There are so many guys that just switch teams. Who are you close to on the AAU circuit? I’m friends with everybody really. I'm close with Karl (Towns) and Kyle (Anderson) and Tyler (Ennis). You know Wayne Selden, Stanley Johnson, Kevin Zabo from CIA Bounce, I’m cool with everybody. Thanks a lot for your time. I appreciate it. Sure thing, I told you I got you. Blue Devil Nation has learned that the first annual Kings of Tobacco Road game which pits Duke and UNC alumni against one another will take place on November 17th at 8:30 PM. The game will be played at McDougald Gym on the campus of North Carolina Central University right after the Eagles women play. The game will feature Kyrie Irving, Nolan Smith, Corey Maggette, Chris Duhon, Elton Brand and Gerald Henderson while the UNC roster features former teammates Jerry Stackhouse, Rasheed Wallace, Brendan Haywood, Antawn Jameson, Vince Carter, Raymond Felton and Donald and Shammond Williams. BDN has learned that the rosters are still liquid and there may well be additions to the game. 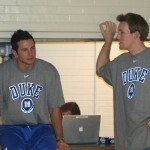 JJ Redick has been mentioned on the Duke side. ACC legend Phil Ford will coach the North Carolina team and talks and the grup hopes to contac Jay Willams to play or coach for the Duke team. The North Carolina Central Women play at 6:00 but the doors will open and part of the proceeds will go to the team. With Central packing it out for the N.C. Pro Am, BDN suggests you get there up to two hours before the start of the women's game to secure a seat. If you purchase a game to the women's game, then you will get one of the best seats in the house. We'll have more etailed information on the ticket situation on Tuesday. In short, this place will be packed out with people being turned away outside, just as they were on certain evenings this past summer for the N.C. Pro Am. The event is a joint effort between the Jerry Stackhouse N.C. Pro Am group and Bleid Sports. The two are also putting on Clash in Cameron on December 17th and games will be at NCCU as well. Stay tuned to BDN for breaking news on both events and we are a proud sponsor of the efforts these two fine groups are associated with. We should have some roster updates in the coming days and much more so bookmark our site for timely information on the event.